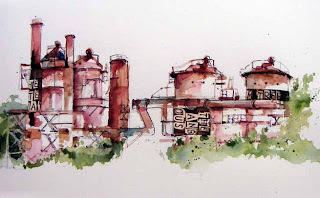 Peggy and I joined Urban Sketchers just after that early trip to Gas Works, so we made up for it yesterday. I was packing some rubber stamps and collage bits to add a little something. Lots of fun... including eavesdropping on the kite fliers, wondering if the guy providing instruction was a professional, a life coach or an overbearing friend of the other two.